So my hanging baskets have been looking pretty sorry for themselves for a while. I tried reviving them but now the weather has started cooling (how can it possibly be Autumn already?) there is not as much of the heat and sunlight that they require to ripen well. So I decided to cut my losses and pick the remaining tomatoes. 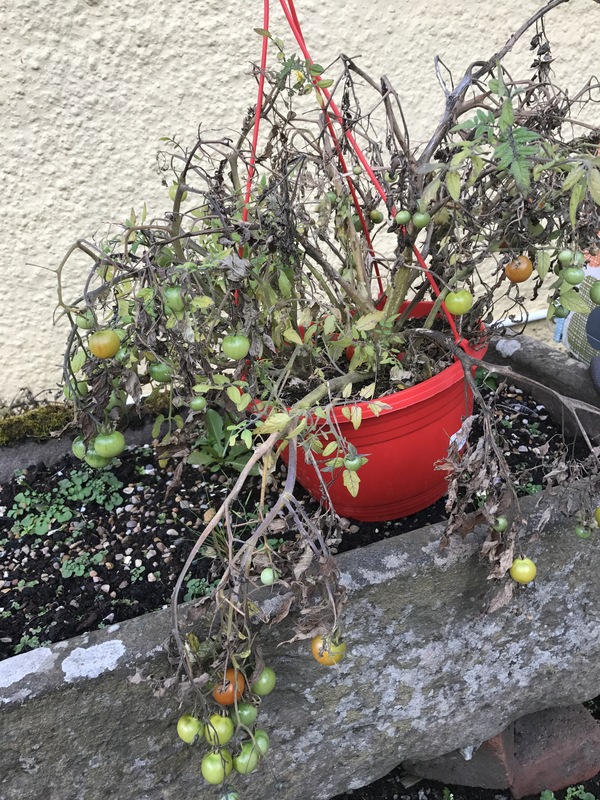 The hanging baskets were starting to look rather unattractive and so they are better off down and out the way emptied and ready to use next year. Any that remain green can become a green tomato chutney, which is a winter favourite of mine with cheese. The green tomatoes reminded me of a type of green tomatoes that can be pickled and are so delicious! Ooh, I’ve not heard of them before, will have to try them out. Yeah the weather has been a pain for us this year too, gorgeous sun shine followed by torrential rain isn’t the ideal mix! Green tomatoes I love them. I wish I had the green fingers needed to grow my own. 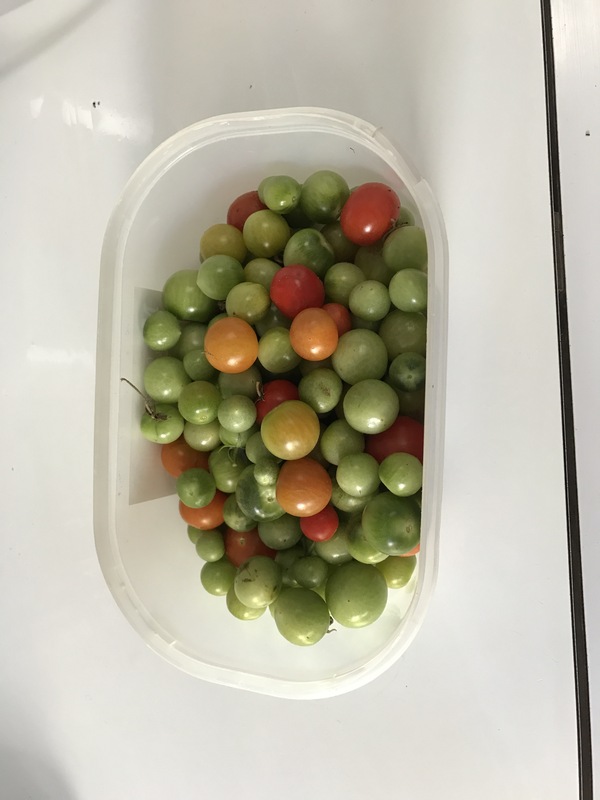 Whenever I grow tomatoes I always end up with masses of green ones. I’ve made chutney before but usually end up ripening them on a windowsill. It’s such a shame. I have slightly more success if they’re in a plastic greenhouse which shelters them a bit. We’re getting a greenhouse in time for next Spring so I’m hoping we have more success next year. It does seem like a bit of a waste having to ripen them inside doesn’t it? My dad also grows tomatoes and we always use the green ones to make salsa with. It’s so good! I’m not quite ready for Autumn either. Our Sunflower is finally blooming – it’s only taken 4 months! We haven’t grown a sunflower but my friend has and hers is amazingly tall! You should try green tomatoes too. I also find them delicious. It goes great with Brie!